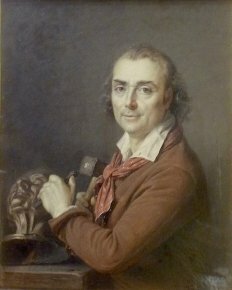 27/03/12 - Restitution - Caen, Musée des Beaux-Arts - We had already told the story here (see news item of 24/1/12) of the miniature by Marie-Gabrielle Capet representing the sculptor Houdon, which resurfaced at the Hôtel Drouot (ill.). As we pointed out at the time, there was no doubt that this was indeed the one stolen from the Musée des Beaux-Arts in Caen, as it presented exactly the same flaws (see news item of 25/1/12). The Pescheteau-Badin auction house graciously admitted the fact and unhesitatingly restituted the miniature to the museum which has just recovered it. Patrick Ramade, the curator, is already planning to organize a small exhibition around it to celebrate an important event in the life of this establishment. Recovering a long lost work, almost a century, is not an everyday occurrence.